Confirm the action. Boaz is in the court of law addressing the situation of Naomi, her land, and the widow Ruth. They have come to agreement and now, Boaz is confirming that everyone knows exactly what decision was reached and why. 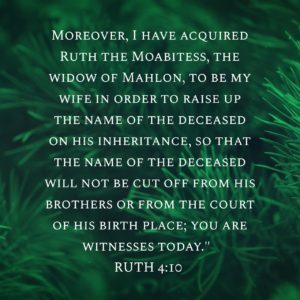 Read Ruth 4:9-10. Whenever you are finalizing something, it is always good to make sure that everyone is on the same page. Boaz was like that. He didn’t want to leave anything to chance with this group’s decision. So, as they were finalizing the decision after the other relative had indicated that he would not be the redeemer in this situation, Boaz states clearly everything that is being decided by this court at this time. Clarity of communication is hugely important. It was just as important then as it is now. Do we seek clarity in our communication with others? Do we confirm what we believe to be the case with a decision? This is really about making sure everyone is on the same page and clearly understands their roles and responsibilities and any expectations as they head out from a meeting together. Boaz knew that there were several people there and he wanted to make sure there was no doubt as to the actions he would be taking after this meeting. When God gives us direction to move forward, he does so very clearly and very concisely. When we share that direction with others, are we as clear and concise in our messaging? God’s messages are always clear if we are listening for them. We must make sure that as we communicate we are being equally clear and then confirm that others understand exactly the message we gave.